Editing one of those into straight laid stones is probably easier than going there, taking pictures and editing them into textures ;-) I couldn't find any laid as they're on the photo, but that's not surprising, since that's very untypical. Usually they're used in a herringbone or more complicated ways, stabilising the whole surface. Even checkers as on the first link are rather unusual, as they also don't spread forces that well. I have taken this advice onboard, but, I am going to go ahead and take a trip along all the stations (since it is my local network), to take reference pictures and get textures. This should be undertaken before the new year, so the road cobbles will have to do for now. 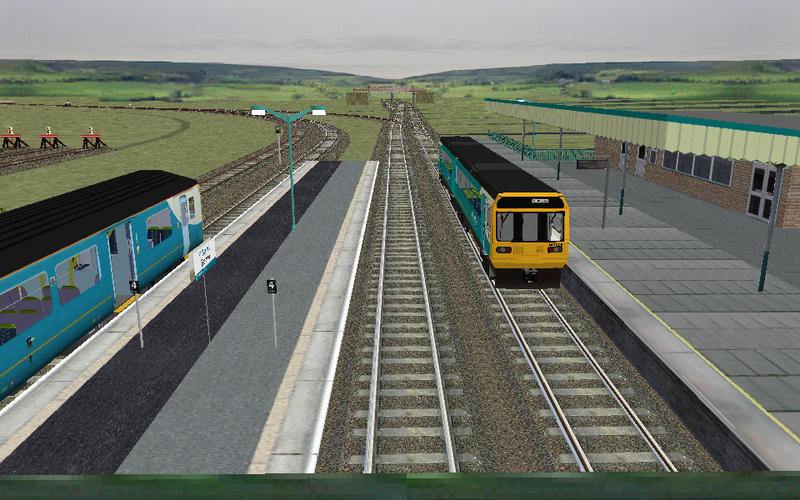 In other news, I have done some work around Cadoxton, and got the cutting in place, with the necessary bridges as well. I have also put a scenic train in, it is modified from the player model I have made (player model has been featured in other screenshots and includes animated doors and full interior. It will be released with the route). I've updated the speed limits around this area too, to better reflect the track conditions. 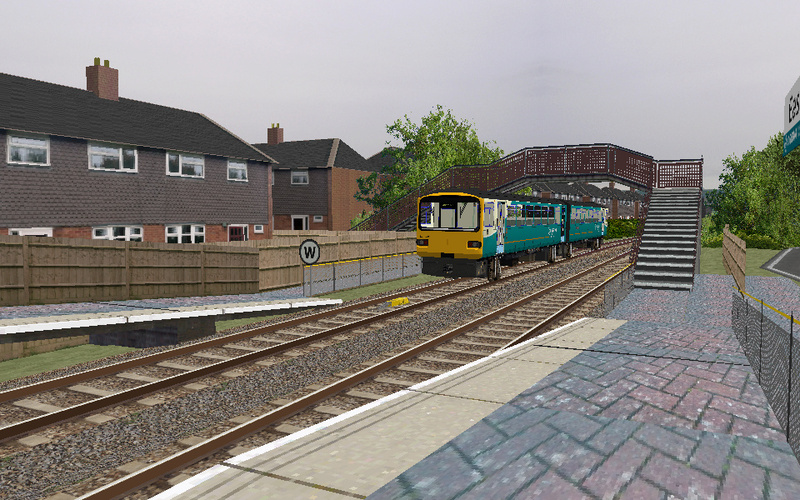 The approach to Cadoxton, showing the scenic train, AWS magnet and new speed limit in force. This shows the signal that the previous AWS magnet was for. The revised speed limit here accounts for the curve and the pointwork on the approach. Going to add some larger foliage to this area now, and then possibly work on some of the industrial buildings in this area. 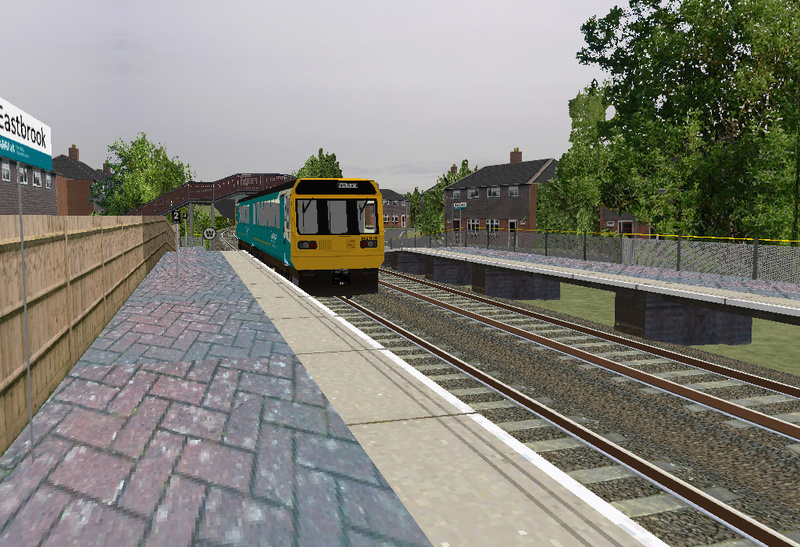 I have now pretty much finished the area around Eastbrook station. I have added foliage and added some temporary housing. These houses will probably have the texture changed at some point, but for now they will stay the same. The cobbles, I am sad to say, have had to stay, due to circumstances, however the track texture has been changed. I must say, I am very proud of this section. It looks pretty much like the real thing! And of course, you can't model a welsh branch line without a Pacer! I know about the 143, the 143 was the first train that I ever downloaded and used. I used it on Cwm Twypsn, and it was at that point I decided I wanted to make things like them. The issue is that I can't use it because the frame rate is horrendous on my laptop, so I use my own models in that regard. Btw, the 143 I modelled, won't be released because I feel it isn't up to the standards of models today. I've gone back to Barry station and given it a bit of a tidy up. Cadoxton now has an industrial area too. I have also made it so that you have to start the train at the beggining of the route. Barry station with its new tidy up. This is taken from the exact same spot as the first picture in this thread. The new industrial estate at Cadoxton. I have also got a question for Graymac. Once the route has been completely covered with scenery, I will be adding a section, about 300m behind the start of the route. This will include a freight loop, for future use. The question is this: There is a road bridge, carrying the A4232 dual carriageway, thus I was hoping to use your motorway bridge from Cwm Twypsn. Could I use this in the route? As a side note, I have mock exams from Monday to Wednesday next week, so the amount of work I will be doing is going to be much smaller. Thanks in advance for understanding/answering my question! It has been a while since I last updated this thread. This is because I have not been working on the route as much as I hoped. I've recently picked up the route again and regular updates are going to come back. 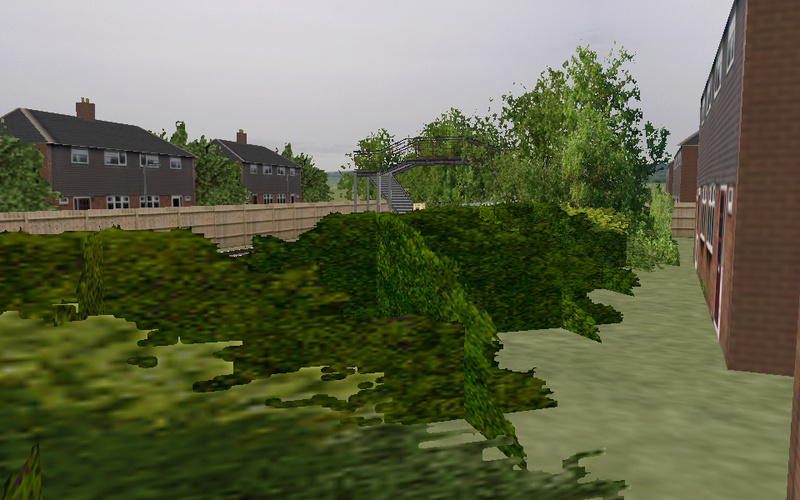 Nestled in the bushes, Eastbrook footbridge can be seen. Textures here have been updated. Eastbrook station in it's entirety. The track textures need to be tweaked slightly, and a new cobble texture is required. After these changes, Eastbrook will be finished. 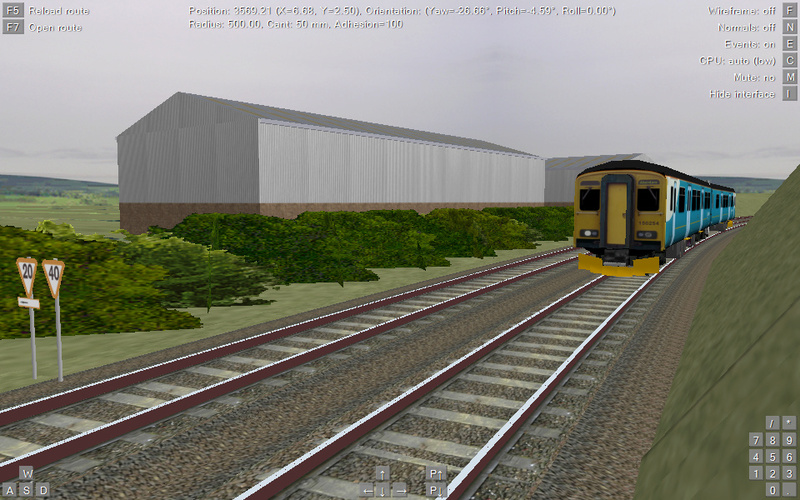 Other changes include some more bushes and hedges along the route, along with some extra details in the flood plains. Between Barry Docks and Cadoxton, the railway is cut into the side of a hill. A class 150 can be seen. Ornate building by Barry Docks Station owned by the council. Isn't the lower level track lifted today? You're half right, three tracks were lifted some time ago, to make way for the by pass (before I was born), however one track remains, used once or twice a year. The docks office is owned by the council and is grade II listed. I think it's a court or something to do with legal issues now. The only thing missing (I think) is the rusty semaphores here. Are you using color light aspect sigs for this route? If you want lower quadrant semaphores do feel free to use the ones I made for Cwm Twypsin. Some nice progress being made!